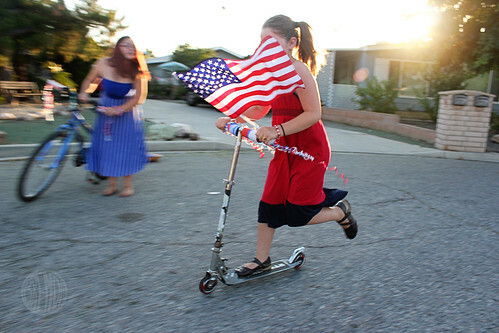 This year has been The Year of the Scooter in our neighborhood. 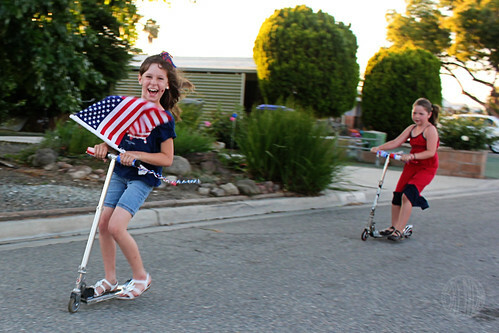 All the kids have them and they spend a good 80 percent of their day riding them around like crazy Evel Knievel daredevils so I decided we’d make a craft that incorporated scooters and bicycles for this Fourth of July. 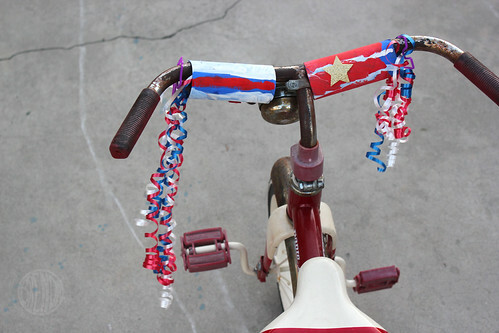 What could be more patriotic than some fancy streamer handle bars for a good old-fashioned Fourth of July Parade!? First we painted. 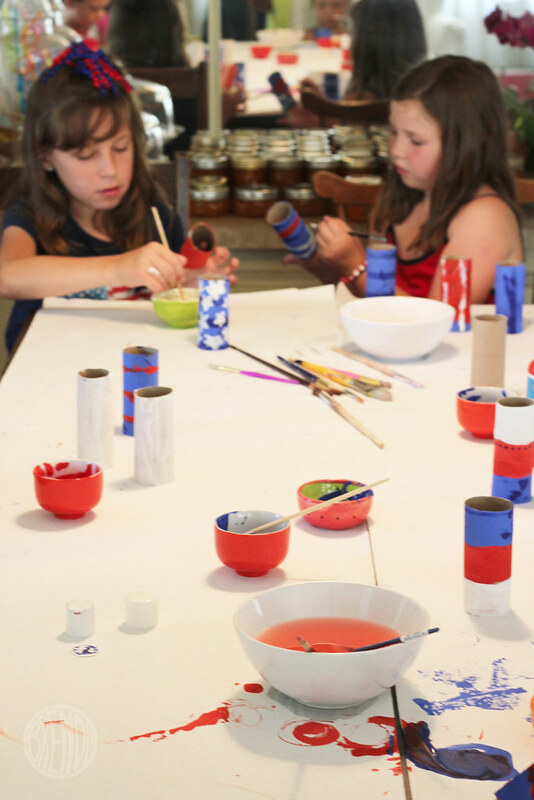 Probably one of the hardest things about this craft was forcing the kids to only paint with one color at a time so that they didn’t mix the white and red and make pink or the blue and white and make purple. 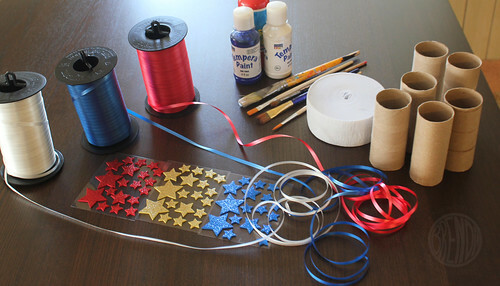 Mixing colors is super fun but I wanted to make sure we kept to our patriotic theme. 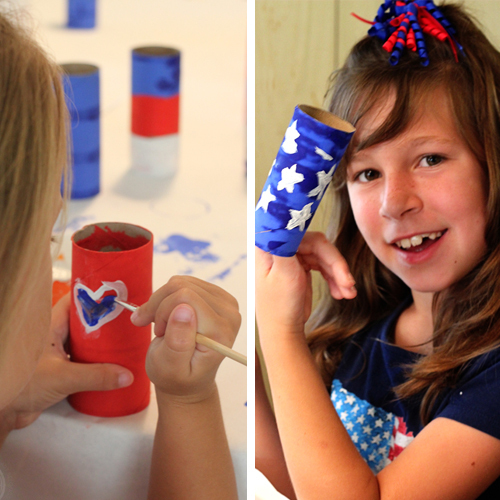 We made sure to let the base coat dry before we went crazy with stars and stripes and of course the ever patriotic symbol of American love, the heart. Painting is always fun. I think we don’t let kids paint enough. Cover your table, cover your floor and stop worrying about the mess. If you use water-soluable paint, clean-ups are not that big of a deal. 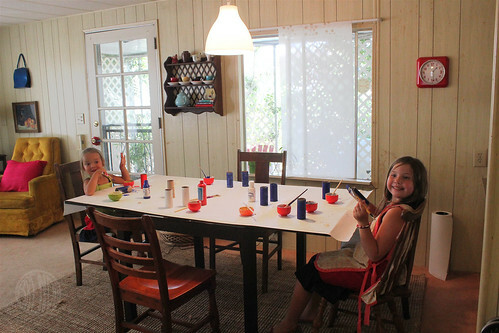 Let them while away the hours with a paintbrush in their hands and this will be a memory they cherish forever. After an hour or more we had a whole collection of festive handle bar covers. 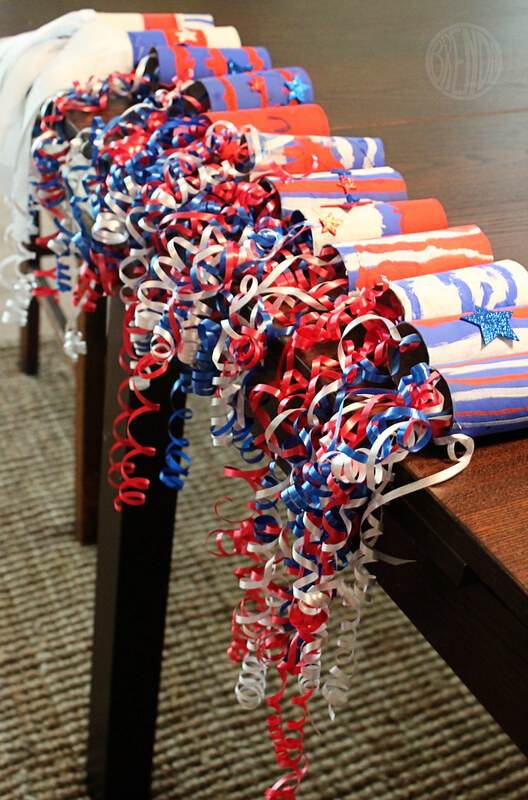 Next we attached the curling ribbon or crepe paper streamers. 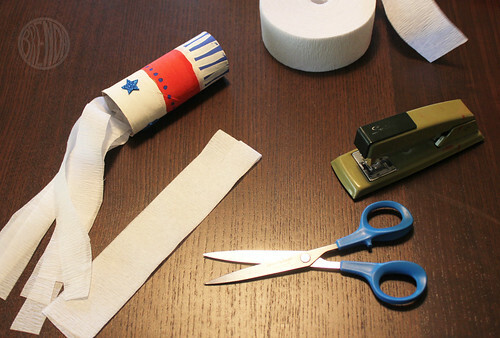 We used a combination of tape and staples to secure the ribbon and crepe paper pieces to the inside of the toilet paper tubes but you might have a better method. One thing I did learn while doing this craft was that when curling ribbon with the edge of your scissors, strength does not equal a better curl. I don’t know how many years I’ve spent wrapping presents and curling ribbon but for some reason I kept stripping the ribbon and ending up frustrated until I learned to go slow and easy with a light touch and then my ribbon came out nice and curly. Maybe it was just me and my cheap curling ribbon but I thought I’d include that tip in there just in case you end up a little frustrated like I did. Easy does it, I say. 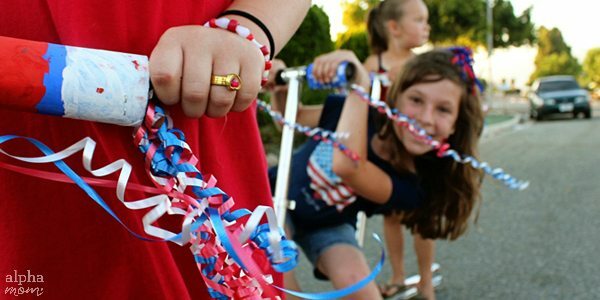 With a little patience and a lot of curling, we had a whole arsenal of handle bars decorations to choose from just in time for our neighborhood parade. 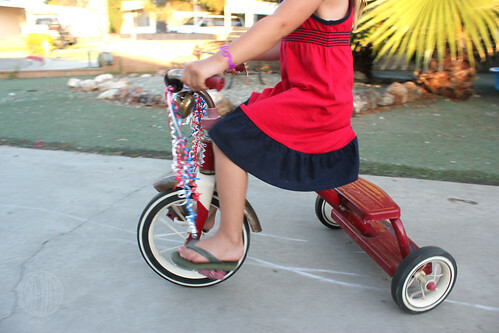 We slid them over the handle bars like so and were off to the races! 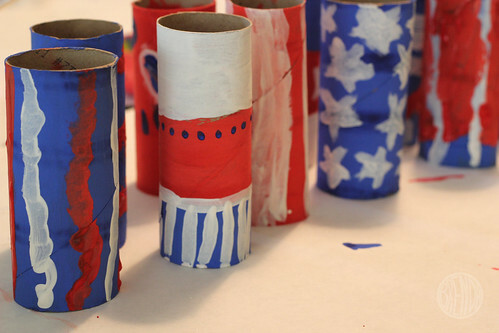 Too bad I don’t have any kids to craft with. 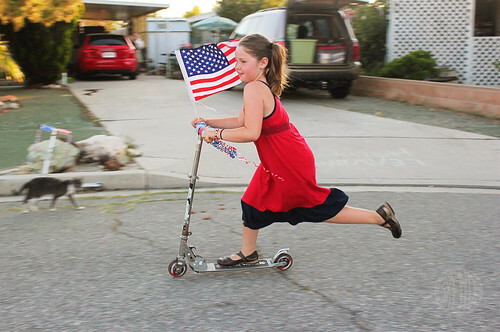 Those are some patriotic photos. I love that you had a parade with the neighborhood kids.